BE WARNED! 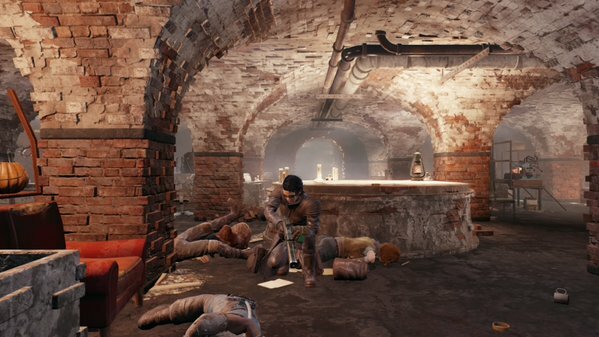 This quest sets you on an inescapable path towards the endgame, and will set you against the Railroad, one of Fallout 4’s major factions. Do not speak to Lancer Captain Kells if you don’t want to make enemies of the Railroad, or if you plan on finishing up any or all of their quests first. For reasons that will shortly become obvious, you'll also lose Deacon as a companion permanently. - You’ll get this quest immediately after completing Blind Betrayal - regardless of how you deal with Danse - and returning to speak to Elder Maxson aboard the Prydwen. He’ll direct you to Lancer Captain Kells, on the bridge of the Prydwen. - Kells gives you your mission with little hesitation: you need to wipe out the Railroad. He’ll give you a list of Priority Kill Orders, which includes five names: Desdemona, Tinker Tom, Deacon, Doctor Carrington, and Glory. Proctor Ingram will appear at this point and give you the P.A.M. Decryption Program, which you can optionally use to ‘recruit’ P.A.M. to the side of the Brotherhood of Steel. By the end of this conversation you’ll be an enemy of the Railroad. - You can no longer access Railroad HQ directly, so you’ll need to use the Old North Church entrance. There are a number of Railroad operatives waiting inside the main room of the Church, including Doctor Carrington; be ready for a bit of a firefight. You’ll have a bit of Brotherhood support, but you’ll still need to do most of the killing. - There’s more fighting to do in the catacombs beneath the Church. Nothing special, just blast your way through the opposition. Once you reach the now-sealed entrance to Railroad HQ, activate the detonator on the stone plaque to bust your way inside. Several more Railroad Agents will try to bar your way. - Last up is P.A.M. If you want to keep her around, enter her small room (it’s well away from the fighting) and put the P.A.M. Decryption Program into the terminal beside her. This will draw her to the Prydwen, and you can find her in Proctor Quinlan’s office. If you’d rather not keep her around, destroy P.A.M. Regardless, return to Kells to finish the quest, as well as receive your next one: Spoils of War.